Are you feeling frustrated because your dog doesn’t respond to you? Does your dog appear to act like he isn’t listening? We understand, and we want to help. Let’s get your dog to listen now. A simple exercise to start with is getting your dog to listen to his name when is not distracted and then when he is distracted. We want your dog to look at you when you say his name. This increases obedience. Salt Lake City will be impressed because even when your dog is distracted he will stop what he is doing when you say his name. With your dog, looking at you, it will be much easier to get him to respond to other commands because he is paying attention to you. Let’s start with how to get your to respond to his name through obedience training. Salt Lake City dog owners have had much success with this training technique. Start in your home with no distractions. Say your dog’s name, and immediately give your dog a treat whether he looks at you or not. Your dog doesn’t have to perform a behavior. We just want your dog to associate his name with a yummy treat. After you have done this over a period of 7 days in a variety of locations in your house, say your dog’s name and pause. He will probably look at you. C/T (click and treat) as soon as he looks at you. Now it is time to work with distractions in your obedience training. Salt Lake City has many dog parks that are distracting. We recommend setting up some simple in-home distractions first such as shaking a bag of treats. When your dog looks away from you at the treat bag, say his name, and immediately give him a treat. Repeat this multiple times until your dog will look at you when you say his name. At this time, you will say your dog’s name, pause and once he looks at you c/t. Repeat this process with easy distractions. Then repeat it with moderate distractions. Now do the same process with difficult distractions. If your dog fails make the distraction easier or move to an easier location. 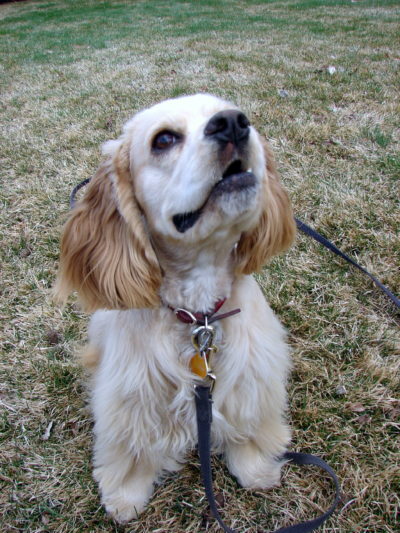 Remember that you need to be consistent and persistent with your obedience training. Salt Lake City is the home of Four Legged Scholars LLC, we can help your dog to respond in our group dog training classes. Check them out.